Allright, I'm off to London! I'm about to leave for the airport, but I have to leave you with a refreshing drink: the Raspberry Slush. I made this with my new toy, the "Slush Ice" by OBH Nordica. It shaves ice, basically. 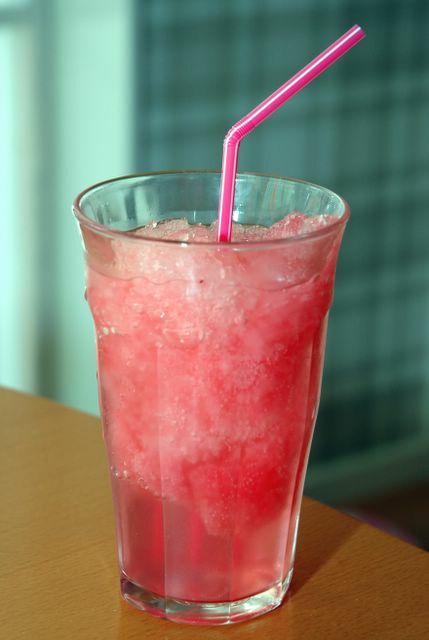 So this drink, which is non-alcoholic by the way, is simple a mix of shaved ice, a splash of Rose's Lime, and about a tablespoon of raspberry puree drink mix (by Finest Call, great stuff.) and a little bit of sparkling water on top. Aaah! And yes, I'm planning on slurping as many frappuccinos as I can get my hands on. Have a fun trip, Anne. I hope it isn't too hot for you. Have a wonderful trip, Anne! Dags för en bloggutmaning! Här!